Are you sick and tire of staring at all the junk that is cluttering up your home, garage, shed or attic? If you are, and you are ready to make a change, then I have the answer to your junk issues. It’s simple, you get to work cleaning away all the junk, and you rent a Junk Bucket to have it all hauled away. Most people let their junk and clutter pile up over the years for many different reasons. Whether it’s old furniture that you replaced but never disposed of, or spare bedrooms that eventually turned into storage closets, we all have junk. Some just let the junk pile up because they don’t know what to do with it if they were to clean it up. Some are too busy to even notice, and before they know it, they have more junk then they can handle. 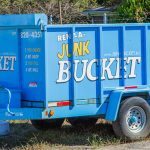 If you have made the conscious decision to get to work and clean your home of all you unwanted junk and clutter, then renting a Junk Bucket is right up your alley. The Junk Bucket is perfect for the DIY’ers out there that don’t mind getting their hands a little dirty, or cleaning up their mess themselves. It offers you an opportunity to work at your own pace, and do things your way. 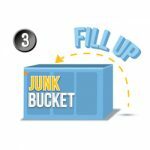 Junk Buckets are smaller dumpsters that work perfectly for homeowners. 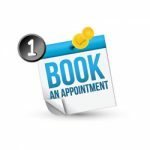 The Stand Up Guys main focus is, and has always been, Customer Service. Same goes for when we are renting our customers Junk Buckets. The Stand Up Guys that deliver and pick up your Junk Bucket are polite, professional and respectful of you, your family and your home. Part of our customer service is offering products of quality, and the Junk Bucket is just that. This isn’t your average roll-off dumpster. 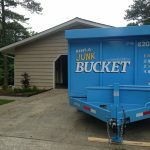 Junk Buckets are designed specifically to be beautiful, and to make your neighbors jealous. 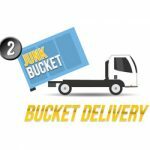 [quote style=”1″]Junk Buckets were specifically designed to be sleek, driveway safe, beautiful, & of course, to make your neighbors jealous. Renting a Junk Bucket Dumpster for you home is easy. All you have to do is pick up the phone and call us, let us know what you are throwing away and when you want it. Once the time is set, you will have a Junk Bucket dropped at your home, ready to be filled at your leisure. You can toss and throw away anything from your home you like into the dumpster. The Junk Bucket is perfect for any home. They are built sleek and mobile. 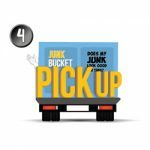 Unlike big, clunky roll-offs, The Junk Bucket can fit into smaller spaces. Like your driveway, sideyard, and more. The Junk Bucket is also built with rubber wheels. This means that there is no chance of damage to your driveway once it’s been dropped. Hints the reason we call them “Driveway Safe Dumpsters”. If you live anywhere in the Tampa Bay Area, you’re in luck. 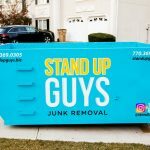 The Stand Up Guys deliver Junk Buckets to home owners all over the Tampa Bay Area, including: St. Petersburg, Tampa, South Tampa, New Tampa, Clearwater, Palm Harbor and more.